The Junior Thespian Induction Point System (JTIPS) is a tool designed to help you keep an accurate record of students' accomplishments and progress toward earning junior induction into the International Thespian Society. Familiarize yourself with JTIPS by watching the ten-minute tutorial video below. The Thespian point system establishes guidelines for logging the quality and quantity of student work. Quality may include the caliber of the work and the educational value of the experience. Troupes may adopt changes to the point system to meet their unique circumstances. Changes are recorded in the troupe’s constitution. Troupe directors must notify students of all induction requirements and provide access to their point records. 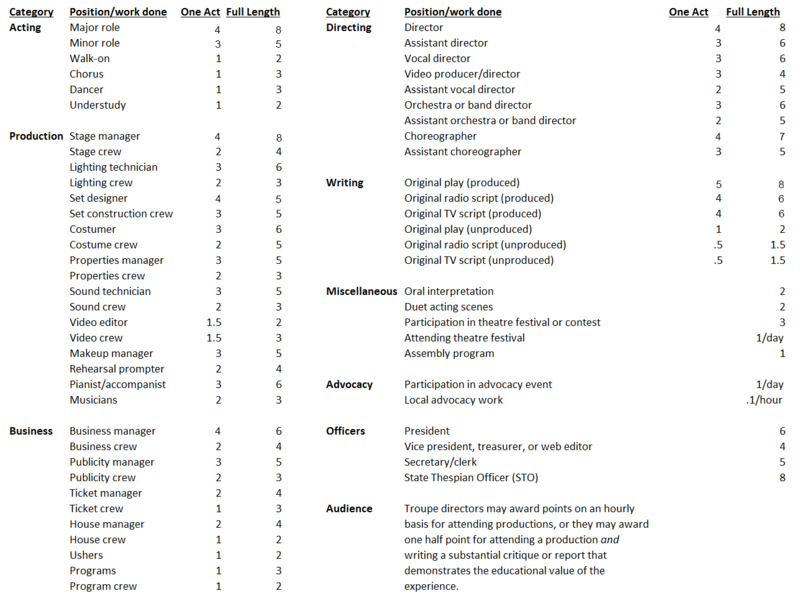 Only the troupe director may award points, but a troupe secretary or clerk is often responsible for maintaining point records. Point record sheets are available for download on the Junior Thespian troupe director resource page. The chart below provides a quick and easy way to calculate points. Numbers indicate the recommended maximum point awards for the duties listed. Troupe directors should use their discretion in awarding points—from zero to the maximum—according to the caliber of effort and work, and they may award up to two additional points for any task performed with exceptional merit. The minimum eligibility requirement for Junior Thespian induction is fifty hours of quality work in theatre arts and related disciplines. One Junior Thespian point represents approximately five hours of quality work. Use this formula to award points for duties that aren’t listed. Performing arts schools and others with mandatory participation may choose to change that to ten hours or more to avoid point inflation and maintain the honorary nature of induction in that setting. Inductees must earn ten points, five of which should be for work done at the school where they will be inducted. Junior Thespians moving to other affiliated middle or junior high schools are entitled to transfer their memberships. Transferring Junior Thespians bring a minimum of ten Junior Thespian points with them to the new school. See the Junior Thespian Troupe Handbook for details. Induction points should be earned through participation in at least two productions, whether formally staged or informal class presentations. Inducted Junior Thespians automatically begin their high school careers with half of the points needed for high school Thespian induction (normally five of the ten induction points required). See the Junior Thespian Troupe Handbook for details. Students may earn up to five points toward induction through participation at the elementary school level; in community, children’s, or professional theatre; or in other activities in the performing arts. They may earn additional points after induction at the troupe director’s discretion and upon verification of participation. Junior Thespian membership will be made available on an equitable basis to all students who qualify. No student will be elected into the Society; and peers may not have a role in awarding points or deciding induction eligibility. Troupe directors can recognize exceptional Junior Thespians after induction by awarding Junior Thespian stars. The Junior Thespian Rating Summary chart at the bottom of this page outlines the basic system. The International Thespian Society recognizes that middle school theatre programs vary widely in scope and structure. The recommended Junior Thespian point awards listed below are provided for schools with curricular and/or extracurricular programs that offer a wide range of opportunities for their students. Often these include formally staged productions before a traditional audience. Some middle school theatre programs are less formal in nature and focus on class presentations, projects, and exercises rather than fully mounted productions. Troupes with this form of program may find it easier to award points on an hourly basis (one point per five hours of excellent work) rather than use the recommended point awards provided below.